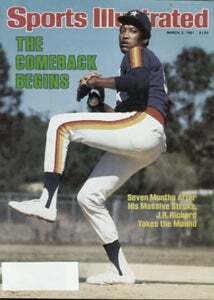 When you think of famous Astros pitchers you probably think of Nolan Ryan or Mike Scott, but J.R. Richard was arguably as good as either while they were with the Astros. The reason he's less well-regarded isn't a matter of racism, though Richard is black and the other two are white. Richard managed 313 strikeouts in one season with the Astros, something neither Scott nor Ryan accomplished while with the ball club, though Ryan is the all-time strikeout king. The real difference is Scott and Ryan were able to finish their careers and Richard collapsed with a stroke during the 1980 season, preventing him from ever finishing his career. Bad luck, two bad marriages and a few bad decisions later Richard ended up living under a bridge in Houston before eventually finding work and a faith community. It's not the end he'd have hoped for or, really, deserved. Some have argued for his Jersey to be retired, and we agree, though we hope it'll be the rare turquoise Astros road jersey from 1978, something so ugly only Chris Bangle, who also had his career cut-short, could envision. Oh well, Ash78 sees more possibilities for Bangle. We preferred the way Richard set the world on fire.